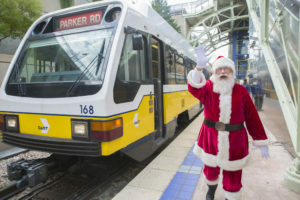 With the holiday season just around the corner, Dallas Area Rapid Transit (DART) is reaching out to all DART riders to support the annual “Stuff a Bus” event scheduled for Friday, Dec. 14. The initiative will deliver socks and blankets to area nursing facilities — as well as unwrapped toys and canned food for children and families in need throughout the North Texas area. DART’s Stuff a Bus” is an annual campaign put on by DART bus operators and police officers. It combines two employee sponsored drives, Santa Cops and Comforting of the Souls, to fill a bus with donations.